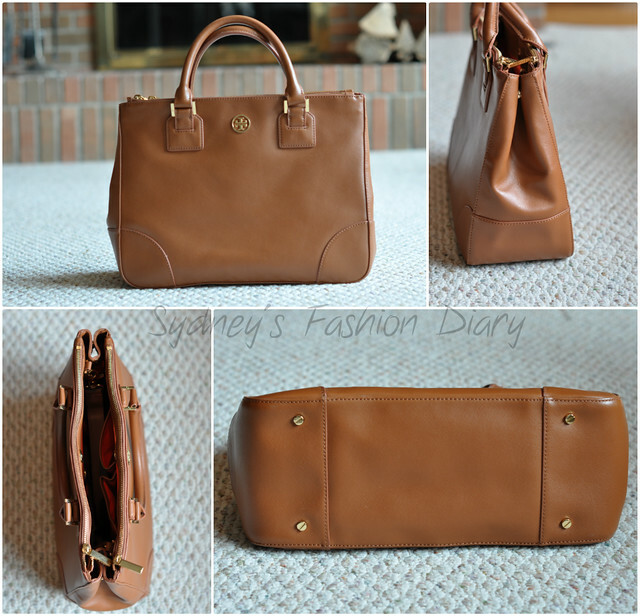 A few readers requested a detailed review of my new Tory Burch double-zip tote...so here we go. I started looking into this bag 3 months ago. I love the way it looks online but wanted to see it in person before I take the plunge. I went to my local Saks and tried on the black one back in December. The Robinson tote can be purchased at high-end department stores such as Nordstrom, Neiman Marcus and Bloomingdales as well as Tory Burch’s site for $575. After seeing/touching it in person, the next step for me was to look for some kind of a discount. I think I've said it before – I don’t mind preowned as long as they meet my requirements. Both of my Chanel bags are preowned and I love them. I wasn't going to buy a preowned Tory Burch but I wasn’t opposed to the idea, either. I watched a few of them on eBay and they all ended up around $475ish. The savings is not significant. I decided to hold out a little longer to find a better deal. A few weeks ago, there was a listing on eBay for a brand-new tote for almost $200 less than the retail price. The first question that came to my mind was why? The reason is that this particular tote was made before summer of 2012. The lining for the Robinson Double-zip tote was redesigned last Fall. Hence, the solid canvas lining vs. the logo jacquard lining. Other than that, everything else is identical to the current version. I did some research online regarding the lining just to educate myself. Unfortunately, I didn't find much on it. However, there was a picture from Neiman Marcus showing the exact same lining. Also, someone here mentioned the orange lining (the review dated March 2012). Even with that, I still had one of the ladies from the Purse Forum authenticate this specific one before making my purchase just to be sure. I do not mind the older lining at all. The condition of this bag, the color and the savings sealed the deal. The seller who I bought this bag from has over 2000 positive feedback and sells mostly designer handbags. However, just like any other purchase, please study and make sure you’re comfortable before making one. This is my first Tory Burch handbag and I am very impressed by the quality of this bag. The saffiano leather is durable, scratch-free and the hardware is nice and heavy. This tote measures 10 1/2(H) x 16(W) x 5 1/2(D). The size is just simply perfect for an everyday work bag. It comes with a shoulder strap for easy access. This tote is a little on the heavy side. It’s not necessarily an issue for me. However, it’s something to consider when it comes to wearability. 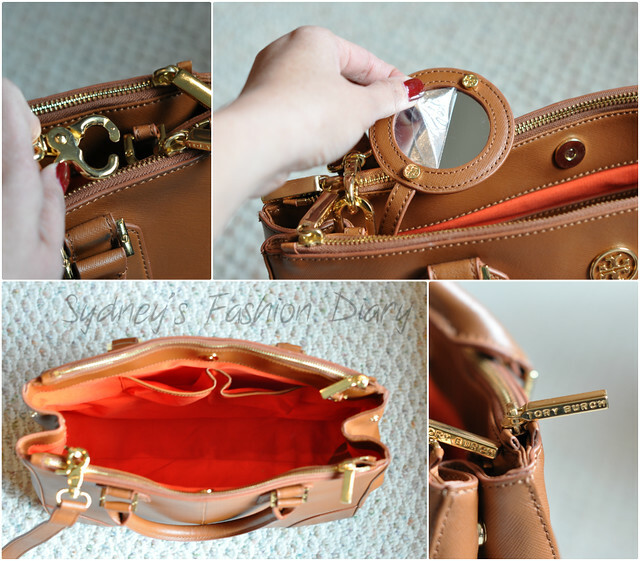 When the shoulder strap is used, it will pull up the inside lining (see the above photo). In the long run, it might damage the lining. I think this is one of the biggest design flaws with the Robinson line. I don’t use the shoulder strap very often. However, when I do, I'll make sure I don’t carry heavy stuff in it. As a conclusion, this is still a great bag for me. It holds all my everyday essentials perfectly and is a classic style bag that will last for years. I hope you find this post helpful. Please feel free to contact me if you have any further questions or comments. So great that you found a pre-owned version that was actually brand new and was authentic! Such patience to wait for it and it paid off! I see the flaw in the strap design and hope it isn't an issue for you in the future. Beautiful bag, dear! i love it! thanks for the review. i actually like that lining in there. nice and bright so you can quickly find anything you need, but not such a light color that you'll see much dirt. congrats on the find! 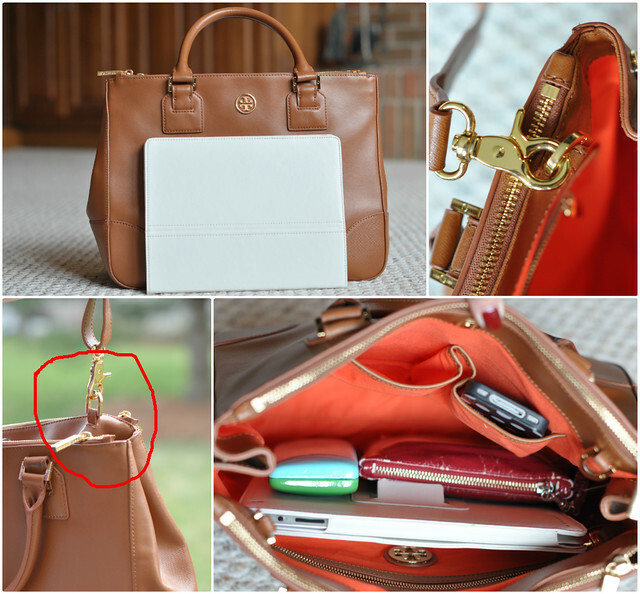 I still keeping my eye on this purse for months now and I know this review will help.Thanks for bringing up about the strap i could say it's one thing about the Robinson i love most.Congrats on your new baby, it's such a great find! Can you let me know the name of the ebay buyer you purchased this from? Thanks. Great read. I like that you shared how you researched for the purse, as the price is on the higher end. It's a lovely bag, and great for day. I'd have a problem with the weight - as you know, toting two little ones gets heavy already - but I just love the smooth look. By the way, thanks for your sweet comment. I'm NOWHERE near my pre-preggors weight, and being in my mid 30's slowed metabolism, but it's nice to receive encouraging words from a mommy #fitspo (like yourself). ohhh your new TB tote is GORGEOUS!!! thanks for reviewing it for us.. i love my chanel bags however i'm looking for a new tote type bag because i find on my running around days i don't have enough space haha!! i need something that i can bag around more i will definitely be checking this out when i go to the mall!! @Anonymous I shared a few eBay sellers who I bought stuff from to some of the readers in the past. Unfortunately, it wasn't always a positive experience for me so I will not be sharing them again. Hope you understand. Thanks for the review Sydney! That is a great deal! I'm always very apprehensive buying expensive stuff on ebay but the husband trusts it a lot and considering the deal that you got on this TB tote, I think I should give it a try! great review! i been wanting one for awhile and never thought about getting a preowned one. The color is perfect! It look just like brand new! I was seriously considering buying this model, but because of the concern, I've decided not to. Thanks for the inputs! this tote have the small size right? Thanks for sharing friend. There is a wide choice of Tory Burch purses that offer a distinct style for any lifestyle. The choices may be overwhelming at first but, you will find yourself looking for only the latest designs. Especially on the part where the sling tugged the inner lining, which is important to me cause I prefer using sling for bags. anyone ever bought the new robinson shoulder tote? ive just ordered it and was wondering if anyone would have a review about it? its the Robinson leather tote, (not double zip), with lots of pockets and 2 outer pockets as well, and it is a shoulder tote.